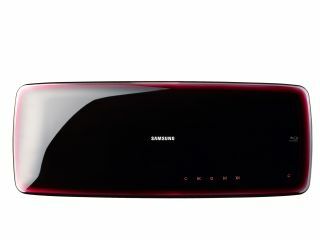 While the world and its dog continues to not buy HD video players, Samsung has defied the odds and launched a wall-mounted Blu-ray player. The gravity defying Samsung BD-4600 launches at CES alongside the more conventional BD-3600, which, in stark contrast, is designed for that niche part of the market which doesn't need to stick its equipment to the walls. The BD-P4600 and BD-P3600 include BD Live (Profile 2.0) and Bonus View (Profile 1.1) support, Full HD 1080p Blu-ray playback with DVD upscaling, and total HD soundtrack support. Standard CD playback, with support for JPEG photos and DivX videos is also included. "Samsung is heralding a new direction for the Blu-ray industry with the BD-P4600 and BD-P3600," said Reid Sullivan, Vice President of Audio/Video and Digital Imaging Marketing at Samsung Electronics America. "The BD-P4600 makes it easier than ever to bring Blu-ray into the living room with its unique, wall-mountable design, while the BD-P3600's comprehensive specs place it on the short list of even the most discerning home theatre consumers." No prices for these products have yet been revealed.